“Today our nation’s youth are demanding their basic human right to go to school without dying in the name of greed. It’s time for Congress to act like adults worthy of their office. PASS TOUGHER GUN LAWS! BAN THE AR-15! STOP TAKING NRA BLOOD MONEY! ENOUGH IS ENOUGH! #neveragain,” the Dumb and Dumber star wrote. Several celebrities, including Dwayne “The Rock” Johnson, Michael Moore, and Debra Messing showed support for the student activist. 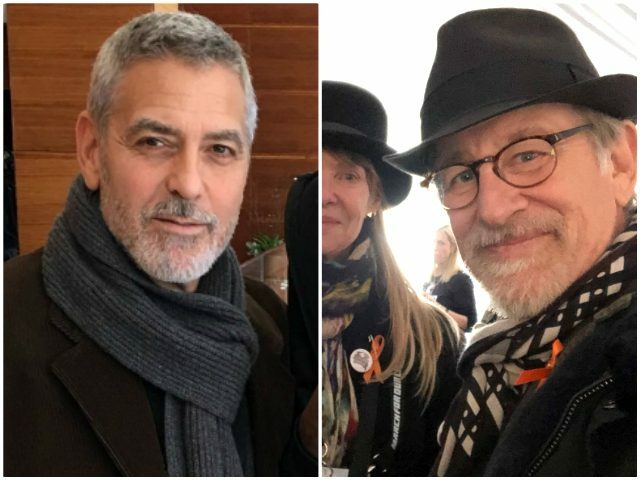 Some Hollywood heavyweights, like George Clooney and Steven Spielberg — who both pledged $500,000 to Saturday’s event — hit the streets with protesters, while a bevy of singers and other entertainers followed suit. Below is a round up of social media posts showing the celebrity presence at Saturday’s student march for gun control. So proud to have marched in #Nashville today. Proud of the youth that started this movement. Proud of Nashville for showing up. So proud of these kids for leading this movement. So disgusted they had to.